Make Boris beautiful with scratch paper wings you design yourself! 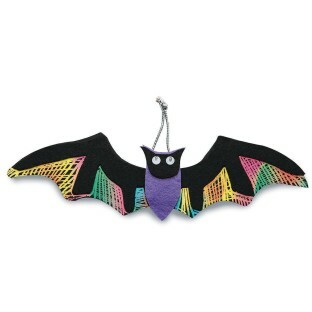 Make Boris beautiful with sticky-back felt pieces, scratch paper wings, wiggly eyes, wood scratch tool and silver cord! Individually packed. Finished bat measures approx. 3-1/4" tall x 7" wide. No glue is required for this craft.